All working Miss Selfridge discount codes, vouchers and offers for April 2019 are shown below. Get student discount with a valid Unidays/NUS number. For instant access to this discount simply register and verify your student status with UNiDAYS. It’s free and available to all students studying in the UK, Ireland, Australia, New Zealand and Denmark. 1. Next working day delivery is available for orders placed before 6pm Monday – Friday, 2pm Sunday (GMT). 2. Our couriers typically deliver Monday to Friday, 8am – 7pm. Please note Saturday and Sunday are not classed as working days for standard deliveries. Saturday delivery is available on our nominated day delivery service. Free Returns on UK Orders at Miss Selfridge via the Collect+ service. Click offer button above to see more details. Get 10% OFF your next order when you sign up for the official newsletter at Miss Selfridge. Standard Miss Selfridge voucher terms and conditions apply. Miss Selfridge began as a response to the youth oriented fashion and culture scene of London during the sixties. This cultural revolution known as 'swinging London' was dominated by modern and new ideas in this era. In 1966, Miss Selfridge launched as a concession in Selfridges department store to embrace the exciting, new phenomenon. Their vision of the latest fashion craze was a success leading to growth into various Lewis' department stores a year later to surviving independently on the high street. There are currently over 180 Miss Selfridge stores that frequent the majority of retail shopping destinations. The boutique brand remains to design cute, flirty feminine fashion taking inspiration from unique vintage prints. The creative in-house design team specialise in sourcing cloths from inspirational places travelling all over the world to produce an individual trend inspired clothing and accessory range. To promote their findings Miss Selfridge use iconic models and actresses in their advertising campaigns. The brand was one of the first retailers to use supermodel Kate Moss and since has employed Yasmin Le Bon and Nicollette Sheridan. An extremely far distance from their humble beginnings in the sixties. Miss Selfridge offers many online features to provide in depth advice and expert knowledge on the current trends and events. The informative tool is a fun and interesting way to demonstrate the latest looks, spy on celebrities' style and discover the latest festival looks. To get your hands on an already discounted from Miss Selfridge's range ensure you search through their sale. Many items are discounted by a large amount, with further 20% reductions on the initial sale price. The brand also offers promotions on certain garment types, such as three pieces of lingerie for £9 or two vests for £12. The most convenient way to find out the exact dates of SALES and promotions is to sign up to their newsletter - the bran also offers 10% off your next order for each sign up. Owning a valid student card will entitle you to 10% off, which can even be used on sale items too. All you are required to do is type in your student card number on the shopping bag summary page. Also, this is the same place to enter your promotional code, which will automatically discount your order. To save money on delivery costs the brand offers many different ways to receive your product. Place your order before 6pm to guarantee next working day delivery or spend over a certain amount to enjoy the privilege for free. Alternatively, there are times when Miss Selfridge offers free next day delivery simply for placing an online order. In addition, there is the option to collect in store to eliminate paying delivery charges. 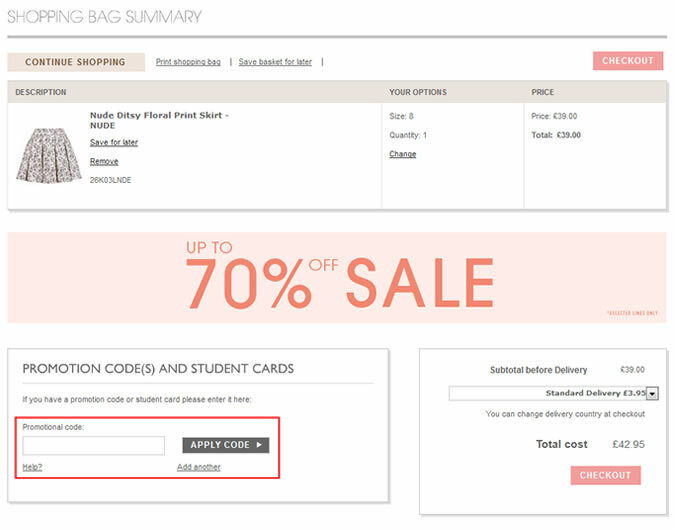 Miss Selfridge offers an account card, which allows you to purchase items to be paid at a later date. This is another way to find out about latest news through your monthly statement as well as receiving a host of privileges. When spending over £35 in store you receive a stamp on your Account Loyalty Card, which could be anything from £4 off to free Eylure Lashes. What are you waiting for?